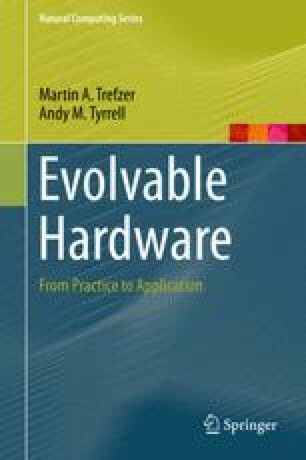 Since the early days of Evolvable Hardware the field has expanded beyond the use of simple Evolutionary Algorithms on simple electronic devices to encompass many different combinations of Evolutionary and Biologically Inspired Algorithms with various physical devices (or simulations of physical devices). The field of Evolvable Hardware can be split into the two related areas of Evolvable Hardware Design (including optimisation) and Adaptive Hardware (Haddow and Tyrrell, 2011; Yao and Higuchi, 1999). Evolvable Hardware Design is the use of Evolvable and Biologically Inspired Algorithms for creating physical devices and designs (or their optimisation); examples of fields where Evolvable Hardware Design has had some success include analogue and digital electronics, antennas, MEMS chips and optical systems as well as quantum circuits (Greenwood and Tyrrell, 2006).